Johns Hopkins to Acquire Newseum Building in Washington, D.C.
Johns Hopkins University has taken the first steps to relocate its Washington, D.C.-based graduate programs to a new, high-visibility home in the heart of the nation's capital, a move that better positions JHU to inform and convene national and global decision-makers and amplify the real-world impact of its research and scholarship. The university announced today that it has reached an agreement, subject to regulatory approvals, to purchase the iconic building that currently houses the Newseum, located on Pennsylvania Avenue, the District's most prestigious thoroughfare. Johns Hopkins plans to transform the building into a modern, world-class interdisciplinary academic facility anchored by JHU's School of Advanced International Studies and optimized for learning, creativity, community events, and the exchange of ideas. Moving the university's D.C.-based graduate programs to a single campus will create new opportunities for interaction and collaboration among those pursuing advanced degrees in Washington at SAIS, the Carey Business School, the School of Nursing, and the Krieger School of Arts and Sciences' Advanced Academic Programs. It also will position Johns Hopkins within steps of the U.S. Capitol building and the decision-makers debating critical issues in one of the world's most influential cities. "With the acquisition and renovation of the Newseum, we will have an unparalleled opportunity to bring all of our current D.C.-based Johns Hopkins graduate programs together in a single, landmark, state-of-the-art building," Johns Hopkins University President Ronald J. Daniels wrote in a message to the university community today. "Moreover, the renovated building will provide opportunities for every academic division of the university to pursue research and educational activities in Washington—complementing and drawing on those conducted on our flagship Baltimore campuses and deepening our connections to debates over national and global policy. Our commitment to contributing our ideas and expertise to these debates lies at the core of what it means to be a vital and relevant university." The property currently is owned by the Newseum's founder, the Freedom Forum, which moved the museum to 555 Pennsylvania Ave. from nearby Rosslyn, Virginia, in 2008. In 2017 the Freedom Forum announced it was exploring a range of options for its future, including the possible sale of the building. The group put the property on the market in early 2018. Johns Hopkins will purchase the property for $372.5 million. The deal gives the Freedom Forum support to preserve its mission for "free press, free speech, and free spirit for all people." 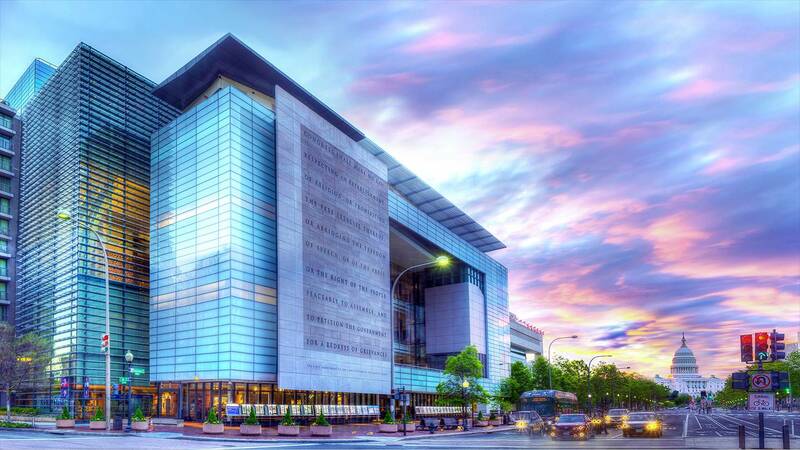 Under the terms of the purchase agreement, the Newseum is expected to remain open to the public at its current location through 2019. Transforming the building's unique and purpose-built design into spaces suitable for academic use will require a significant renovation, as well as a number of required reviews and approvals by regulatory agencies. An initial estimate by JHU Facilities and Real Estate is that construction could begin as soon as the fall of 2020 and will take about two and half years, meaning the building could be ready for move-in by early 2023. When completed, it will contain more than 400,000 square feet of space. "It's a huge facility, and we do intend to make some major changes," said Lee Coyle, the university's senior director of planning and architecture. "Considerable interior modifications will be required to repurpose the structure from its current use as a museum into a venue that supports JHU's higher education mission in D.C. today and for decades to come. "We want spaces that are conducive to collaborative study and faculty-student interaction," he added, "including seminar spaces and spaces for our public events." The Carey Business School also leases space in a fourth building, located at 1625 Massachusetts Ave. Collectively, those buildings are home to more than 3,300 Johns Hopkins faculty, staff, and students. That includes 1,300 individuals at SAIS, which has occupied its Massachusetts Avenue home since 1950. "Throughout our school's history, Washington, D.C., has acted as an extension of our main campus, putting our students in close proximity to diplomats and policymakers and giving them unparalleled opportunities for hands-on learning and networking," SAIS Dean Vali Nasr said. "Those opportunities will only grow as we move into our new home on Pennsylvania Avenue. It's an exciting moment for SAIS and for Johns Hopkins University." The purchase of the building will be financed by a combination of proceeds from the eventual sale of the Massachusetts Avenue properties, institutional funds, and philanthropic support, Daniels said. As renovation planning begins, he added, faculty, staff, and students in D.C. and across the university will be engaged to ensure that the university's new home in Washington meets the needs of the Johns Hopkins community.